The AAMA 511 (Voluntary Guideline for Forensic Water Penetration Testing of Fenestration Products) is a guide developed by the American Architectural Manufacturers Association (AAMA). The purpose of the AAMA 511 is to provide specific information to assist industry professionals in selecting appropriate standards for the application of field investigations of fenestration products. This guide provides supplemental guidance to the ASTM E 2128 (Standard Guide for Evaluating Water Leakage of Building Walls). The AAMA 511 details a specific fenestration test that is not mentioned in the ASTM E 2128, the optional Sill Dam Test. This test is used when the source of the leak is thought to be related to a defective fenestration product. The testing is very simple; the base of the fenestration, the subframe/receptor (sill), is subjected to a static water head for 15 minutes. All of the weep holes/drainage systems are blocked, and a dam is installed on the exterior to hold the required depth of water. The height of the water is determined by the amount of pressure the fenestration product is rated. Example: 1 inch of water equals 5.20 psf, so if the specification for testing requires a test pressure of 6.24 psf, the height of the water would be approximately 1.2 inches. Typically, you would test the fenestration at 2/3rd of the rated design pressure, the pressure specified for field-testing. Once the appropriate depth of water is reached, we monitor the test specimen for leakage. The adjacent building materials (drywall/interior finishes) should be removed to allow for visual observations. Additional ways to detect water intrusions are covered in the ASTM E 2128. NOTE: The AAMA 511 Sill Dam Test may subject the fenestration product to water exposure greater than a naturally occurring weather event. It is NOT to be used as the sole criteria to determine whether or not the fenestration product is defective. With the exception of the Sill Dam Test, all of the investigative techniques can be found in the ASTM E 2128. These techniques are far too often forgotten because investigators rely on assumptions rather than following investigative testing protocols. The improper diagnosis of a water intrusion can result in unnecessary repairs, additional water damage, and inevitably, an unhappy building owner. The time and expense to perform an initial, well focused, accurate evaluation of a water intrusion will save the interested party money in the long run and result in repairs that extend the service life of the building. BDG utilizes professional testing equipment that is calibrated to each specific testing standard for accurate results. Our field consultants are properly trained and knowledgeable of all testing standards. BDG has extensive knowledge of most building systems and specializes in forensic water intrusion investigations. This allows us to not only properly test fenestrations on new construction projects, but also pinpoint the cause of any test failures and provide accurate recommendations to achieve successful testing results. Failures during quality assurance (new construction) testing can result in unnecessary delays that impact your bottom line. 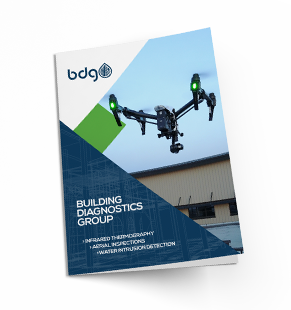 If you are looking for a reputable second or third-party testing company to perform accurate professional testing, provide concise reports, and help you through the entire process, contact BDG today. We provide testing services throughout the United States from our headquarters located in Atlanta, GA.
Professional services based on accurate information that helps you or your company make the right decision regarding your project or asset.